Despite creating a beautiful, feature-rich and well thought-out wireless speaker, Sony’s SRS-X9 fails to deliver consistently high quality sound over its wireless and wired inputs. The wireless audio phenomenon in consumer tech is huge and isn’t showing any signs of slowing down. It’s into this already crowded category that Sony is throwing three new contenders for your wireless speaker dollars. The biggest and baddest of the three is the SRS-X9, a sophisticated-looking all-in-one affair that straddles the line between bookshelf speaker and home theatre sound-bar. 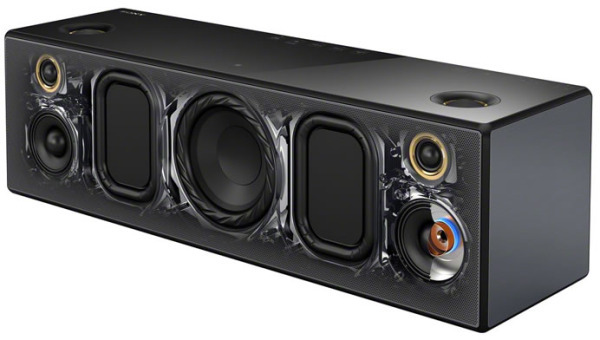 The SRS-X9, which retails for $699 CDN, is priced at the high end of the wireless speaker market, placing it in competition with the Sonos Play:5 ($499) or possibly the Sonos Playbar ($749) as well as offerings from Pioneer,Bose, Bowers & Wilkins, Polk Audio and Marantz. As you would expect from such a device, it offers a wealth of connectivity including Wi-Fi, Bluetooth, line-in (via mini-jack), Ethernet and USB. It’s also DLNA and AirPlay compatible. I’ll admit it: when I read the press release for Sonos’s new sub-woofer, the Sonos SUB, I was skeptical. Why would anyone need a wireless sub? When I think “sub-woofer” I picture home theatre set ups- you know the kind- 5, 6 or even 7.1 surround systems with that “.1” referring to the sub woofer which, more often than not, is tucked into a corner, hidden under a plant or sometimes concealed behind a wall panel. What these configurations all have in common is permanence. Your average home theatre buff will spend a fair amount of time figuring out optimal speaker placement and once wired in to their locations, never moves them again. Why would Sonos seek to market a wireless sub to this group of buyers? Yes, the Sonos sub enables placement options that wired subs can only dream of, but when I tell you that Sonos’s sub is incompatible with every amplified home theatre system on earth, you’re probably going to start scratching your head. I sure did. Before I explain this bizarre limitation, let me clarify who the Sonos sub is actually aimed at: people who already own, or intend to buy one of Sonos’s all-in-one speakers, the Play:3 or Play:5 or their Connect:Amp powered receiver for bookshelf speakers. Now, about that strange incompatibility. Let’s do a quick refresher on the nature of sub woofers. Subs are designed to do one thing and do it well: provide the low-end bass reproduction that standard speakers simply can’t deliver. In home theatres, they are loved for that couch-shaking rumble on movie soundtracks. Audiophiles use them to fill in the lows that their dedicated stereo speakers can’t reproduce. But regardless why you use a sub, your receiver/amplifier plays a critical role. Every system that includes a sub needs a setting known as “cross-over.” Cross-over is the frequency at which the sounds you are playing are divided into signals. All sounds above the cross-over frequency get sent to the regular speakers. All sounds below that frequency get sent to the sub-woofer. Sometimes, as with inexpensive HTIBs (Home Theatre In A Box) systems, that cross-over frequency is set at the factory and can’t be changed while receivers/amps used in component systems will typically have an adjustable cross-over frequency so you can get the perfect calibration for your specific speaker/sub-woofer combination. So what does that have to do with the Sonos SUB? Well, just like every other sub-woofer, the Sonos SUB needs to have a cross-over frequency established. On Sonos systems, that cross-over setting is managed in the software and is dynamically set based on the particular combination of Sonos speakers in your room(s). But because the software uses its knowledge of volume levels and amplification of ALL the speakers in your system, it can’t make the necessary adjustments if your system included components that the software isn’t aware of from an amplification point of view. This includes any externally-amplified speakers you are running through one of Sonos’s Connect devices. These devices only pass music signal, not amplification to a set of speakers. Conversely, all Play:5, Play:3 and Connect:AMP components will work with the SUB. One of the benefits of the Sonos software-controlled cross-over system is that the cross-over frequency can change. Not only can it change based on which speakers you’re using with the SUB but it can also change as you adjust your volume levels which means you’re always getting the optimal amount of low-end for any moment in time. If the engineers at Sonos ever feel the blend needs to be adjusted, they can do so via a software update. The down-side to this arrangement is you can’t tweak the cross-over frequency if you aren’t happy with how the software is dealing with it. If you haven’t already guessed from the details so far, the Sonos SUB is intended to enhance the enjoyment of music within an existing Sonos set-up. This is not a sub for home theatres. As an acknowledgement of this fact, Sonos took a little more care with the design and materials in their SUB. After all, if your sub-woofer is wireless and can be placed anywhere, why not show it off a little? The SUB’s piano-black gloss finish and striking shape makes for a great conversation piece. But look a little closer and you’ll see that Sonos’s engineers found an intriguing solution to a design challenge. Their research told them that traditional down or side-firing sub-woofers limit placement options for consumers. Their boxy shapes can be hard to hide and they certainly don’t slide under couches very well. At the same time, rectangular subs, while easier to stow under furniture, aren’t much to look at if you do need to leave them visible. To make a sub that was both elegant when seen and slim enough to be hidden, Sonos employed a “ying-and-yang” arrangement: two speaker cones and ports which fire from opposite sides, but both facing the inside of the cabinet – the donut hole in the centre of the SUB. The benefits of this design are two-fold: because there are no externally facing speakers, you can position the SUB with any of its five available surfaces facing down and sound quality is never compromised (the “bottom” should probably never be used on “top” for balance reasons). Plus, overall vibration on the SUB’s cabinet is reduced to negligible levels thanks to balanced output of the two drivers. It’s the sub-woofer equivalent of a boxer engine. It’s also worth mentioning that Sonos’s built-in wireless system creates a level of flexibility that wired sub-woofers simply can’t match. If you use Sonos gear in a multi-room configuration, but decide that you don’t need sub-woofer power in each of those rooms all of the time, simply unplug the SUB, carry it to the other room, plug it in, and then associate it with the new room from within the Sonos app on your smartphone or tablet. The software does the rest, including a recalibration step that ensures you get the right balance between the SUB and the speakers in your second (or third or fourth etc..) room. I auditioned the SUB in a small listening room at Toronto’s The Spoke club. Sonos Product Manager Craig Wisneski had two Play:3 speakers set up at either side of the room, configured to run in stereo mode (each Play:3 speaker reproducing just one channel respectively). We sampled several tracks including some reggae standards which are perfect for checking out low-end sound thanks to their bass-heavy rhythms. Without the Sonos SUB, the sound produced by the stereo Play:3’s was already (to my untrained ears) full, rich and satisfying. Adding the SUB to the mix did exactly what you would expect – it filled out the low end that you hadn’t even noticed was missing. It very much reinforced for me that the SUB has been designed for music – not movies. The effect of turning on the SUB was immediate and noticeable while retaining a subtlety I don’t usually associate with sub-woofers. It many ways, it does what all good audio gear should do. It gives you the impression that you weren’t hearing the full range of music before you added it to your set-up. Here’s the part that might give you pause when considering if the Sonos SUB is right for you: the price. At $749 the Sonos SUB is more expensive than two Play:3 speakers plus the Sonos Bridge all put together. It’s a big expense for a product that many consider a nice, but optional extra to their music system. And while Sonos has plans to release a slightly cheaper $649 matte-black version of the SUB later this year or possibly early in 2013, that’s still twice what it costs to buy a decent powered sub-woofer for component systems. But therein lies the catch – if you want that deep bass sound to accompany your existing Sonos wireless speaker set-up, there is – for now – only one game in town. Is the SUB $749 worth of sub-woofer? Probably not. But if you value stunning industrial design, the convenience of place-anywhere-wireless convenience and a speaker that has been designed to provide optimal low-end sound for your existing Sonos gear, then it might very well be worth the asking price. In any event, you’ve got a few weeks to decide/save up – the Sonos SUB starts shipping July 30th if you order online. But if you’ve already made up your mind, you can pick one up right now at selected retailers and installers such as Best Buy, Future Shop but call first as stocks are limited at this point.